Guillermo set out to make one of those rare Gothic-Romance stories, something that hasn’t been done well in a long time. There are some frightening moments in the film of course, but there aren’t a ton of “jump at you” scares, which is a breath of fresh air from all of the recent horror movies as of late. Instead, this is a slow burn of terror that follows a woman who falls in love with someone who is not who he appears to be. Guillermo and Matthew Robbins’s script allows enough time to set up each character with good amount of backstory, so that we may connect with them. Even the villains. Set in the late 19th century, we center on a young female author named Edith Cushing (Mia Wasikowska), who lives with her wealthy father (Jim Beaver), and is mostly courted by a local doctor named Alan (Charlie Hunnam). One day, a man comes into town by the name of Sir Thomas Sharpe (Tom Hiddleston), and with his British accent, he charms Edith and tries to secure funding from Edith’s father for a new invention back in England. The two fall for each other and after an accident, Edith moves to England with Sharpe and his sister Lucille (Jessica Chastain). Once at the Sharpe estate, which is a run-down, creepy looking mansion, or something that would have suited Vincent Price and Edgar Allan Poe quite well, things take a turn for the worse. Edith begins hearing and seeing strange noises and frightening apparitions that seem to be after her, or at least trying to tell her something. All the things that go bump in the night come full force, and is executed flawlessly by Guillermo’s eye. Sooner than later, Edith starts discovering who the Sharpes are and where they came from, which is not very pleasant to say the least. In between the scary moments, we get a look at the relationship between Thomas and Edith, which has a very ‘Romeo and Juliet’ vibe to it, but we also get the relationship angle from Lucille’s angle as well. Lucille is an excellent character to watch through the entire film and see her past through stories that made her what she is today. Del Toro’s camerawork has eerie similarities to Stanley Kubrick. Everything is perfectly famed and symmetrical with a ton of great tracking and slow moving shots. The pace is even on par with ‘The Shining‘ from Kubrick, which lets all hell break loose in the finale. This Gothic-Romance-Ghost-Story is a home-run for Del Toro, and I’m sure ‘Crimson Peak‘ will remain in people’s minds for a while. ‘Crimson Peak‘ comes with an excellent 1080p HD transfer and is presented in 1:85:1 aspect ratio. That being said, the film is fairly dark, visually speaking as well as figuratively speaking, which tends to darken some of the really cool details in the costumes and sets of the old haunted mansion. The picture is somewhat soft throughout, but that doesn’t stop the image from being as beautiful as it can be. It’s just that the detail isn’t as vivid or sharp as it could be, which is again, a shame, because of all the amazing sets and costumes. In extreme closeups in the rare bright sequences, you will be able to make out fine facial features on the actors as well as the intimate stitching in the impressive costumes. Other than that, things look rather flat. Colors look excellent when it comes to the gothic realm with a ton of cold blues, grays mixed in with some earthy browns and oranges. Nothing really pops off screen with the exception of the color red, which is bright, bold, and pops right of screen. Black levels are deep and inky for the most part and skin tones are natural as well. There was some video noise, but it wasn’t too heavy. There also was zero aliasing and banding issues, too, which was great. Overall, this video presentation is great, but I wish the detail was a tiny bit better here. This release is one of the very few releases to have the new optional DTS:X mix, which is an object based sound format (similar to Dolby Atmos). There is also a DTS-HD MA 7.1 mix, which will be reviewed here. This film is a slow bourn gothic romance with supernatural horror elements, so the soundscape is crucial here. Luckily, this audio presentation knocks it out of the park. The sound effects are robust, layered, and well-balanced from start to finish. Each moan, scream, door creak, and haunting noise is perfectly mixed. The surround and rear speakers ooze with these great sounds with excellent directionality. The ambient noises in old time New York as well as the old house noises of the mansion is amazing and fluid. The score always adds to the suspense and emotion of the film without drowning out any dialogue or other sound effects. Speaking of the dialogue, it is always crystal clear and easy to follow, and free of any pops, cracks, hiss, and high shrills. The bass packs a punch when it needs to, especially in the heavier suspenseful moments without crossing into rocky territory. The LFE is excellent and the dynamic range is very wide here, leaving this audio presentation with great marks. Audio Commentary – Guillermo Del Toro might be the best film speaker and lover of film in the world working now. This commentary track is amazing and I’ve listened to it twice already. The master of movies talks about how he made the film, how the audience should perceive it, how the studio didn’t market the film right, the music, the actors, set pieces, and more. This is now in my top 5 audio commentaries. 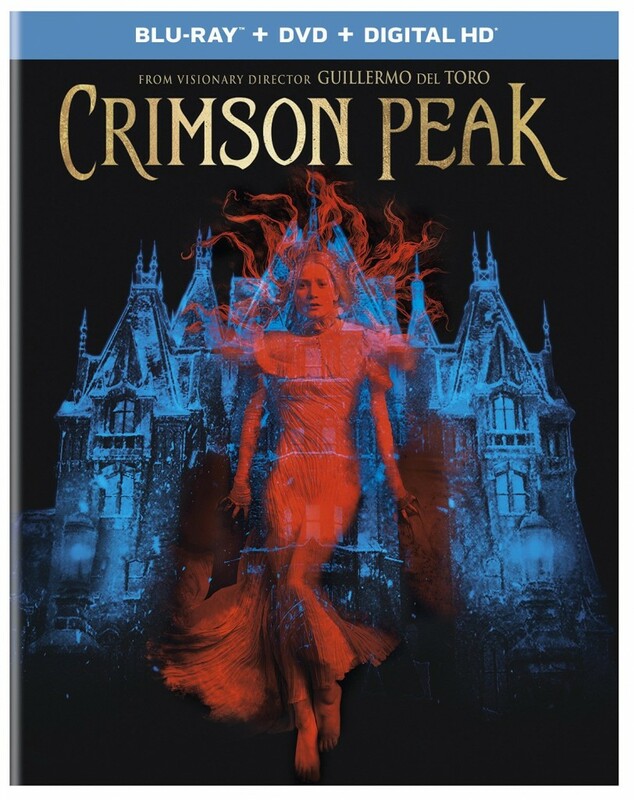 I Remember ‘Crimson Peak’ (HD, 19 Mins.) – This is a 4-part featurette that takes a look at the sets and locations of the film, with the crew talking about what inspired them to make the sets like they did. Deleted Scenes (HD, 5 Mins.) – There are five one minute deleted scenes here, all of which are worth watching, but you’ll see why they were edited out. A Primer on Gothic Romance (HD, 6 Mins.) – Guillermo Del Toro and the cast talk about the gothic history and themes that take place in the movie. 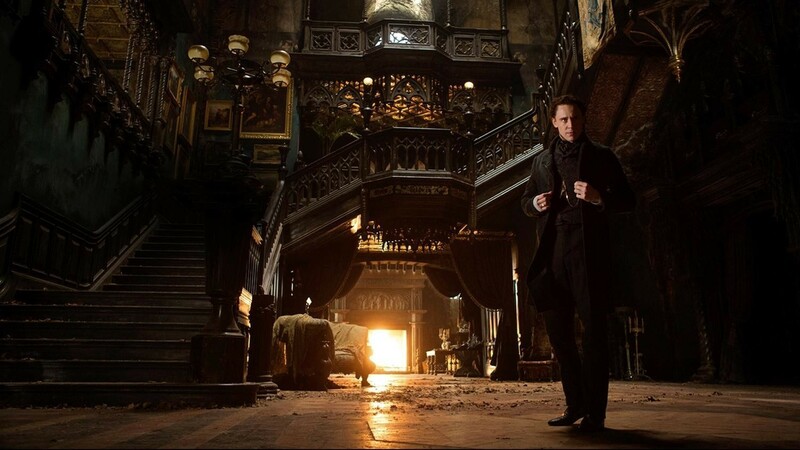 The Light and Dark of ‘Crimson Peak’ (HD, 8 Mins.) – Here the crew talks about the film’s use of color and production design. Hand Tailored Gothic (HD, 9 Mins.) – Here is in depth look at the wardrobe and all the work that went into the costumes of the film. A Living Thing (HD, 12 Mins.) – Here is also an in depth look at the mansion used in the movie and all the crew did to make it look haunted and run down. 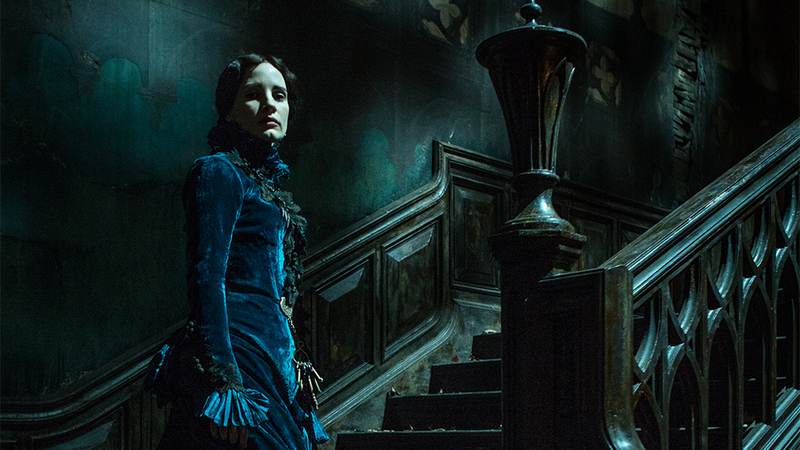 Beware of ‘Crimson Peak’ (HD, 8 Mins.) – Tom Hiddleston takes us on a journey through the mansion. Crimson Phantoms (HD, 7 Mins.) – Here we have the visual effects, both practical and CG discussed here. I love seeing how makeup and visual effects artists create the monsters. ‘Crimson Peak‘ is one of the greatest gothic romance films of all time with a bit of horror mixed in. Guillermo Del Toro sure shows us why he still is one of the finest filmmakers working today here. Everything is beautifully shot and the story is told very well. Excellent performances all around, make this film one of the better movies of recent memory. The video and audio presentations are both worthy with the audio aspect being amazing. The extras are plentiful and a lot of fun, with the audio commentary by Del Toro being one of my favorites. Don’t think twice about purchasing this Blu-ray. This entry was posted on Sunday, March 6th, 2016 at 9:49 pm	and is filed under Film, News. You can follow any responses to this entry through the RSS 2.0 feed. You can skip to the end and leave a response. Pinging is currently not allowed.